Rhyming songs, proverbs, riddles and games for children present fun ways to play with words and meaning, to develop language learning, and to remember and pass on culture and history from generation to generation. They also provide opportunities to introduce young children to cultures other than their own. Following is a comparison of two children’s books that contain rhymes for young children. We highly recommend one of them and do not recommend the other. 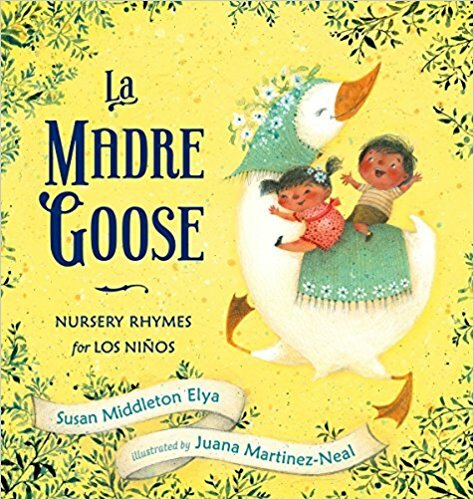 La Madre Goose is Elya’s reworking of 18 classic Mother Goose “nursery” rhymes, with Spanish words thrown in. The idea seems to have been to introduce Spanish words to English-speaking children who are already familiar with these rhymes; and if there’s any appeal at all, it’s to parents looking to add Spanish words to their young children’s vocabularies. But the subtitle of this volume, “Nursery Rhymes for los Niños” notwithstanding, it was not intended for Spanish-speaking youngsters. Tossing a few Spanish words or phrases into European nursery rhymes does not transform them into something that’s “multicultural” or “bilingual” or “code switching” or anything other than opportunistic and appropriative. The result of what might have been envisioned as creative and fun wordplay is a hodgepodge of phrases that make no sense in Spanish or English. La Madre Goose is confusing, not to mention insulting, to young hablantes—the Spanish-speaking children who are never considered in this kind of project. got a wife for his new casa. Peter Pumpkin got a wife for his new house, which she repainted. Wouldn’t he have gotten a house for his wife? Does Peter consider his wife like a piece of furniture? If Elya had something in mind beyond rhyming when she created this, it’s hard to tell. Who cries down the lane. In this poem that originated in medieval times, the three bags of wool are said to represent one-third for King Edward I (the “master”), one-third for the Church of England (the “dame”), and the rest (after he’d paid the 66% wool tax) for the poor shepherd, whose children were probably starving (“the little boy who cries down the lane”). Baa, baa, black oveja, have you any lana? Sí, sir, sí, sir, three bags llenas. and one to be shared by my brother and mi padre! What is this? Is Elya’s poem about the necessity of sharing with your family? If so, then why isn’t the wool divided into four equal parts, instead of three? Why do sister and mom each have one bag full, while brother and dad have to divide one between them? Is this a lesson about fractions? Or about making amends for centuries of inequality? Or is it possible that Elya’s sheep is distributing her own wool—in bags—to her own family? While Elya’s gratingly awkward combinations of English and Spanish don’t make any linguistic or cultural sense, Martinez-Neal’s luminous artwork makes this book lovely to look at. The softness of her warm, gentle paintings, on an earthy palette of blues and teals, beiges and yellows, highlighted by purples and oranges, appears to be a true labor of love. The results here are depictions, many in groups, of chubby-cheeked multiethnic children and cuddly animals with childlike expressions to whom the youngest kids can relate. Martinez-Neal’s own babies, she told me, were models for some of the children here. It’s unfortunate that Martinez-Neal’s beautiful artwork cannot save this contrived, formulaic and unimaginative book. La Madre Goose: Nursery Rhymes for los Niños is not recommended. 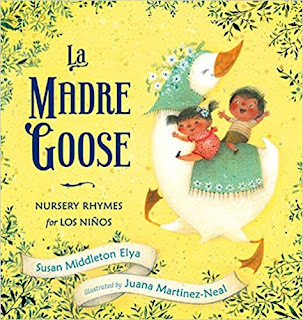 Mamá Goose: A Latino Nursery Treasury / Un Tesorio de Rimas Infantiles is everything that La Madre Goose: Nursery Rhymes for los Niños is not. Ada and Campoy planned the sections together and then chose the selections in this extensive compendium that contains lullabies, finger games, lap games, sayings, nursery rhymes, jump-rope songs, song games, proverbs, riddles, tall tales, and much more (including an outrageous ballad about a dead cat—“El señor don Gato”—who is brought back to life by the smell of sardines). The entire volume is lovingly compiled and beautifully illustrated with exuberant children and animals; and the poetic Spanish is “creatively edited” into English. Each section has a thoughtful and educational introduction and, although I would like to have seen a note about each piece’s cultural origin, it’s clear that great inspiration, planning, talent and execution went into every aspect of this project. Suárez’s deceptively simple watercolor illustrations, on a bright, earthy palette of mostly browns, greens, blues and golds, portray multicultural and multiethnic children and their relatives, and the design elements reflect the diversity of Latin-American and Spanish traditions as well. For instance, young readers will see children and adults in Peruvian, Mexican—and even medieval Spanish—dress, and there are Mexican adobe houses and Cuban and Puerto Rican tropical beaches and huge Spanish edifices along with borders that feature Spanish tiles and Mexican piñatas and papel picado, just to name a few. And children will love the illustrations of smiling animals behaving in species-anomalous ways—such as carefree rabbits, playing and chasing carrots in the sea, while smiling fishes happily cavort on dry ground. Colorful chapter headings and borders, along with white space that leaves lots of room for both the Spanish and English texts as well as the illustrations, make for an attractive, uncrowded, child-friendly design. One thing rarely portrayed in this kind of anthology for children—and something that deserves special mention—is the depiction of a variety of social classes, some in poems that abut each other. Here, for instance, are two upper-class girls and a boy in Spain. The girls, in red dresses and mary jane flats, carry white parasols and the boy, in an expensive-looking suit and hat, carries his schoolbooks. They are on “el paseíto de oro”—the golden path—without a care in the world. Here is a poor vendor (“la carbonerita”), also in Spain, wheeling a heavy coal-filled cart. Her face and apron covered with soot, she asks the reader, “How can you expect me to keep my face clean, if I am a coal-seller?” And here is a hard-working young servant girl, who washes, irons, cooks, cleans, sews, and sweeps—until Sunday, when she can go out to play. Since Ada and Campoy selected pieces recognized all over the Spanish-speaking world, it seemed natural for them to offer the Spanish versions first—which encourages Spanish-speaking parents and grandparents (as well as teachers) to share their own remembered rhymes and stories with their young hablante relatives and students. As well, following the Spanish pieces with those that have been “creatively edited” in English—and set off in italics—will have English-speaking children enjoying them as well and, by looking over to the Spanish, learning some Spanish and connecting with cultures other than their own. Unfortunately, the introductions for each section appear in English only. This is frequently an issue that publishers justify by design space limitations and assumptions about “secondary” languages’ (although, in this case, Spanish is the primary language) being unnecessary in prefatory material. In education, while language equality is improving, la lucha continúa. 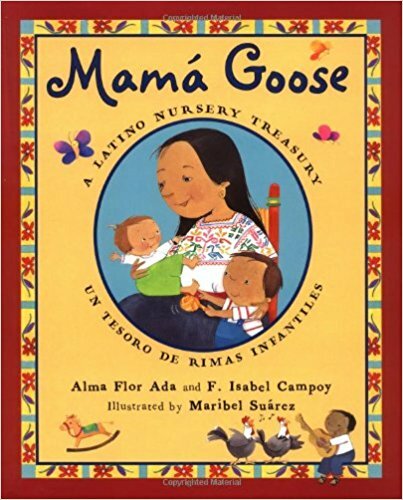 Mamá Goose: A Latino Nursery Treasury / Un Tesorio de Rimas Infantiles is indeed a treasure. It’s highly recommended. Míl gracias a mi amiga y colega, María Cárdenas. Just a note: I'm not sure about the histories you give for those nursery rhymes. My area is fairy tales, not nursery rhymes, but I've read some of the Opies' work, for example, and they don't mention these. The earliest date they give for "Baa, Baa, Black Sheep," for instance, is the late 18th century. That doesn't mean it couldn't have been circulating in oral form prior to that, but...it's a big leap from the 18th century to the middle ages. Thanks, Veronica. My limited research pointed to the wool tax for King Edward I and the Church of England. I'd like to see what your research found, but in any case, "Baa, Baa, Black Sheep" is not an apolitical ditty about sharing wool.